MAY 23, 2016: Our Association has some exciting news that I would like to be the first to share with you. As you know, in addition to our advocacy work for public retirees, we also seek ways for members to save money through exclusive discount programs. 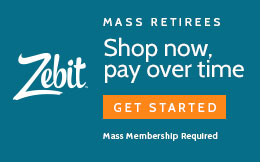 Due to the success of these programs, retirees have asked that we offer more ways for members to save. APRIL 6, 2016: Today begins the month-long open enrollment period for the state’s Group Insurance Commission (GIC). Retirees and employees insured by the GIC now have until May 4, 2016 to make changes to their health insurance coverage or join the retiree dental insurance plan. Over the years, millions of retired state and local workers — including teachers, police officers and firefighters — have received sharply reduced Social Security benefits, simply because they have had multiple jobs during their careers and weren’t allowed to pay into Social Security at all of them. MARCH 25, 2016: On Tuesday of this week the House Subcommittee on Social Security held a special hearing on H.R. 711: Equal Treatment of Public Servants Act. Association President Frank Valeri and Legislative Director Shawn Duhamel were present at the hearing and also met with key Congressional leaders from both parties, as well as Ways and Means Committee staff. MARCH 16, 2016: In a major step toward resolving a complex problem we have fought to resolve for more than thirty years, the US House of Representatives will hold a hearing on H.R. 711, known as the Equal Treatment of Public Servants Act. H.R. 711 reforms the Social Security Windfall Elimination Provision (WEP) to create a more accurate and fair accounting of credit earned under Social Security. MARCH 12, 2015: In a major step toward reforming the Social Security Windfall Elimination Provision (WEP), the American Association of Retired Persons (AARP) has endorsed HR711 and urged Congress to take action during the 2016 Session. The support comes on the heels of a meeting with the 38 million-member strong AARP that was led by the Retired Texas Teachers and Mass Retirees. AARP’s policy committee then put their stamp of approval on the proposal early this week. 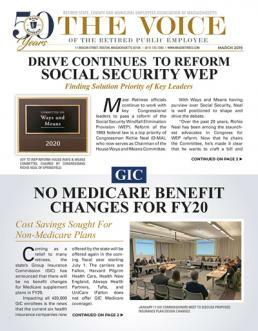 MARCH 4, 2016: Retirees who are enrolled in the state Group Insurance Commission’s (GIC) Option Medicare Extension (OME) plan received very good news this week – health insurance rates for FY17 will decrease by 7.2%. Last year, OME enrollees experienced an increase of 6.5%. Two years ago, the same rates decreased 0.4%. In addition, the GIC has voted to maintain the same copayments and deductibles that have been in effect for the past year, without any increase. MARCH 1, 2016: Association officials joined our Texas counterparts on Monday for a series of meetings in Washington DC aimed at consolidating support for the passage legislation reforming the Social Security Windfall Elimination Provision (WEP). FEBRUARY 24, 2016: The Association will be on Florida’s Gulf Coast during the week of March 1st for two membership meetings. For longtime members, please note that our meeting location has changed. We will no longer meet in St. Pete, but rather at a new location in Largo, FL. Members can expect to hear updates on the Social Security Windfall and Offset laws, retiree health insurance, life insurance, veterans benefits and a host of other legislative initiatives. February 12, 2016: Today the Group Insurance Commission announced the schedule for the 2016 Health Fairs. This is an annual practice that the GIC conducts during its open enrollment which this year runs from April 6th to May 4th. With an eye on rising costs, the health care industry today is looking for new ways to contain spending while improving patient care. It’s a monumental goal, one that insurers and care providers, prodded by landmark health care laws, are trying to tackle. Dolores L. Mitchell has been doing it for nearly three decades. NOVEMBER 21, 2015: Members who are insured under the state Group Insurance Commission’s (GIC) Option Medicare Extension (OME) plan will have a new prescription drug provider as of January 1, 2016. As the GIC and our Association have been reporting for nearly a year, prescription coverage under the OME plan is being transferred SilverScript. Under federal law, retirees must be given the opportunity to “Opt Out” of the new drug plan. The tentative budget agreement forged by congressional leaders and the Obama administration will ward off a historic spike in Medicare premiums for the coming year, but it will nevertheless require nearly one in three older Americans to pay 17 percent more in monthly premiums for doctors’ visits and other outpatient care. OCTOBER 27, 2015: The federal government is about to come to the aid of public retirees who have been bracing for a major increase in Medicare Part B premiums for 2016. On Wednesday, October 7th, our Association will hold its first ever Springfield-Area meeting. The meeting begins at 11:00 AM at the Dante Club in West Springfield. All members are invited to attend. Guests are also welcome. On August 31, approximately 600 former state employees, who retired under the Employee Retirement Incentive Program (ERIP), will be receiving their first pension payment, retroactive to June 30, 2015. According to the ERIP law (Chapter 19, Acts of 2015), the State Retirement Board had 120 days (4 months) from the date of retirement (June 30) to issue pensions to the ERIP retirees. AUGUST 11, 2015: Legislation that would increase the basic life insurance benefit for state retirees and active employees has been released with a favorable report by the Joint Committee on Public Service. Association officials worked closely with Committee Chairmen Rep. Jamie Murphy (D-Weymouth) and Senator Jim Timilty (D-Walpole) in recent months to advance the legislation forward prior to the start of the FY17 state budget cycle. JULY 21, 2014: Following Governor Charlie Baker’s approval of the 3% COLA for state and teacher retirees, Treasurer Deb Goldberg saw to it that the 1st payment for FY16 will be included in the July pension check.